Most websites have reported a mystery Z01B showing up on GFXBench.com recently. 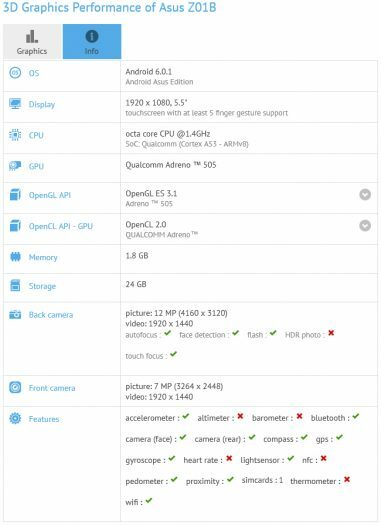 In our opinion, what we have here is the first sighting of the Zenfone 3 Laser (ZC551KL). Let’s have a look at what specs the benchmark has uncovered. The Zenfone 3 Laser is a 5.5-inch phone, a resolution of 1920 x 1080, 2GB RAM, 32GB storage, 13MP rear camera, 8MP front camera, sim card slot, Android 6.0.1 OS, Snapdragon 1.4 GHz and Adreno 505.